By executing these values, I believe we earn our clients trust, and there is nothing more important to the life of our company than ensuring our clients value and trust our expertise. There have been a number of books and articles written on this topic, however the one that resonated with me the most came from a Forbes.com article and touches on three simple but impactful tips. Great Service Matters. The article sites a survey that explains when customers trust a brand, 83 percent will recommend that company to others and 82 percent will continue to use that brand frequently.It’s clear that great service, leads to an increased level of trust. Think about how you’d want to be treated as a customer. Consistency Breads Harmony. Doesn’t this sound poetic? Consistency starts with setting internal expectations. Which bleeds into external results. Transparency is Clear. Be upfront. Be clear. Don’t hide from mistakes. Address what needs to be addressed in a well-thought out way. What’s true in life is also true in building client relationships – honesty is the best policy. 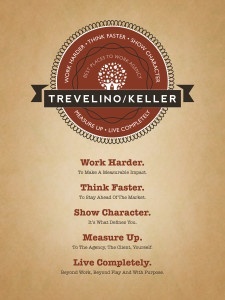 Carrie is an Account Director at Trevelino/Keller. She is active in the startup community in Atlanta and heads up a number of startup focused initiatives for the agency.